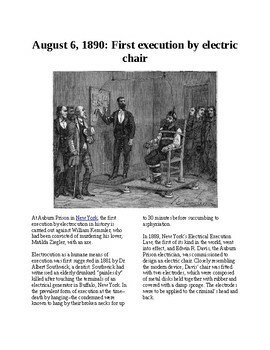 This is an informational reading article about the first attempt at execution via electric chair. To make this assignment even more engaging, download my assignment "Author's Purpose". 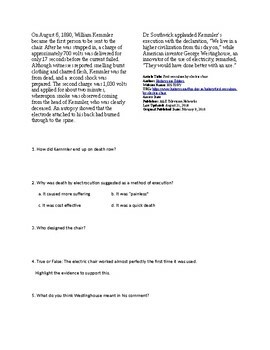 https://www.teacherspayteachers.com/Product/Authors-Purpose-Reading-Supplemental-Activity-no-prep-4198661 This is a perfect assignment to use as a "Bell Ringer" or "5 Minute Reading/Writing" type of activity. It also works well as a substitute teaching assignment or extra credit. The information is from the History Channel's website, the questions are mine. Can also be used as a web quest using the history.com website. MS Word doc for easy editing.